Boulder Junction area is the "Musky Capital of the World" youll find Serenity at the Top of Wisconsin. Plan a house or cabin vacation rental to take advantage of the beautiful snowmobile trails, abundant silent sports and award winning fishing that will allow you to take in Wisconsins Northwoods in all its natural splendor. Refresh your spirit in Lac du Flambeau! Located in Wisconsins Northwoods, explore its chain of lakes or paddle 71 miles of rivers and streams. Known as one of the top birding destinations in Wisconsin and for its premiere fishing, Lac du Flambeau is the perfect vacation destination for outdoor adventures and quiet relaxation at a cozy vacation rental. The Presque Isle and Winchester area are Wisconsins Northwoods Last Wilderness. 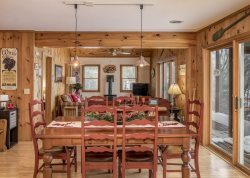 Deep in the heart of the northwoods, a house or cabin vacation rental will surround you with the sounds and sights of the forest and give the you the peace and tranquility you were hoping to find on your next vacation.